Sen. Susan Collins says an attack would not work and would risk entangling the U.S. in Syria's civil war. PORTLAND – U.S. Sen. Susan Collins, R-Maine, says she was skeptical from the start that a U.S. military strike would stop the Syrian government from using chemical weapons again. Speaking to about 200 Jewish constituents Sunday afternoon at Temple Beth El, Collins explained her opposition to military force in favor of a diplomatic solution to Syria’s use of chemical weapons in the country’s civil war. Maine’s senior senator spoke one day after the United States and Russia announced an agreement on securing and destroying Syria’s chemical weapons following days of negotiations in Geneva. The Obama administration had threatened a punitive military strike on Syria after it said that country killed more than 1,400 of its own citizens in a chemical weapons attack last month. Collins said she had several concerns when she and five other Republicans visited Vice President Joe Biden’s residence on Sept. 8 and talked with President Obama for more than hour. Collins said Syria does not pose a direct threat to the United States and would consider a U.S. military strike an act of war. “At this point, military strikes risk entangling the U.S. in a protracted and dangerous civil war,” Collins said. Collins said a military strike would also be ineffective in removing Syria’s chemical weapons stockpiles. “When it comes to Syria, we have an obligation to use nonmilitary options. In the Syrian crisis, the last chapter is a long way from being written,” Collins said. Collins said while she was concerned that Obama’s backing down on his support of a military strike would weaken the country’s military credibility, she finally concluded it had no lasting impact. “The credibility of our nation goes beyond one statement by one president,” Collins said. 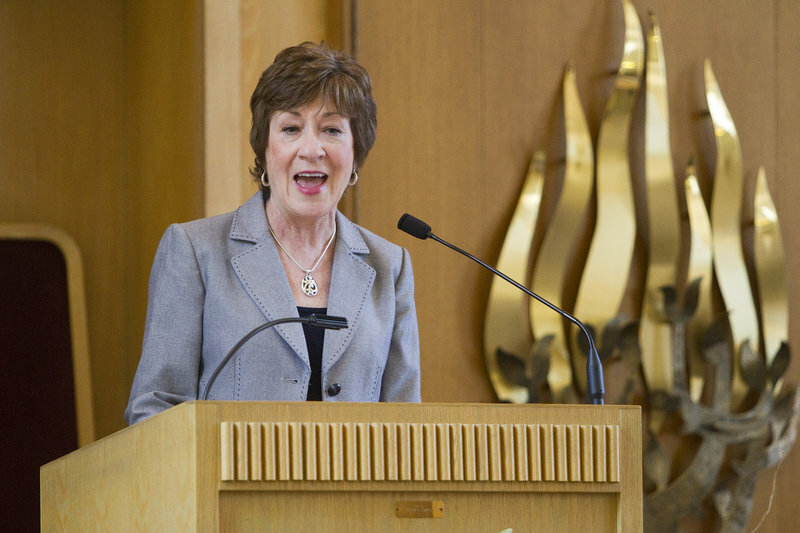 Collins spoke to a largely receptive crowd about how Maine and the United States benefit from the strong U.S.-Israeli alliance.Collins called Israel America’s strongest Middle East ally. She said 75 percent of the $3 billion the United States provides in annual military aid is spent by Israel on military equipment manufactured in the United States. “This provides a great return,” Collins said. She said that Israel, long experienced in fighting terrorism, has provided the United States with invaluable information about how to screen airport passengers, combat bioterrorism, beef up port security, improve bomb detection and train law enforcement in anti-terrorist techniques. She noted that Israel developed the armor used on U.S. military vehicles in the wars in Iraq and Afghanistan and coagulating bandages that have saved American lives on the battlefield. She said Israel, with a population of 8 million, is also an important trading partner of the United States, buying $14 billion in American goods annually, about the same spent by Italy, with a population of 60 million. Michael Peisner of Portland asked Collins for her take on the latest round of Israeli and Palestinian negotiations. “I am not that optimistic,” Collins said. Jeffrey Barkin of Portland asked Collins why people should trust a continued strong U.S.-Israeli alliance when Congress is so divided along partisan lines. “Israel is one of the few issues where support is deep and bipartisan,” Collins said.